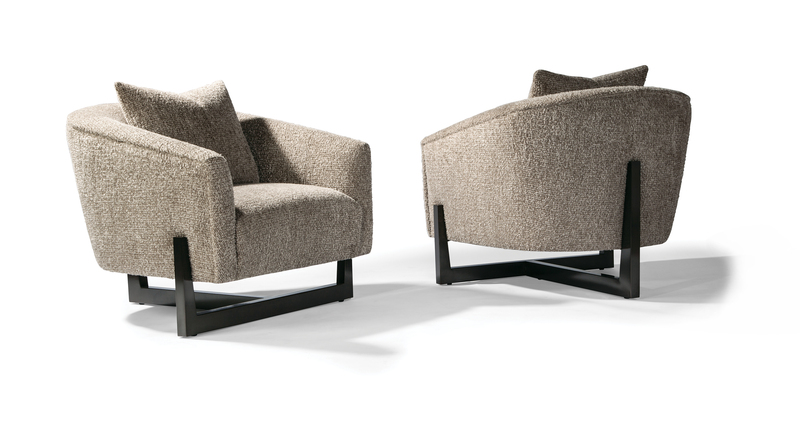 The Suspender lounge chair is one of our new modern classics. Designed by Ransom Culler, the chair’s sleek, curved deep seat is snuggly suspended on a three-pronged, liquid bronze base giving it an appearance of floating on thin air. Suspender’s seating features Marshall coils and double-needle stitching for unparalleled comfort and durability. The lounge chair can be upholstered in any of our in-house curated fabrics or leathers or provide COM. Height to top of back cushion 35 inches approximately. Base and legs: Liquid bronze finish. No. 1428-601 back pillow is optional. Must specify.